Imagine running a course around Arduino. As soon as you start drawing a crowd, the hardware cost will be significant. Enter the Shrimp. The Shrimp is an ultra-slim, low-cost Arduino clone. Bringing the price down to about £8, almost a third of an Arduino, this makes easy to use programmable logic even easier to reach. Thanks for the pingback. Just thought I’d clarify on pricing. 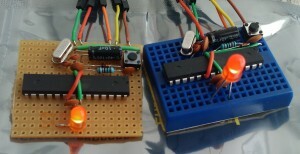 You should be able to put together a Shrimp for around £1.55 on stripboard , or on mini-breadboard £2.30. We use a CP2102 for USB->UART connectivity, for about £1.50. That’s assuming workshopping volumes, buying components for 50 or so. So without USB->UART the Shrimp can be one tenth of a typical £16 price, and with a USB->UART about one fifth. Thanks for the feedback! Great to get some details! Also, keep up the great work!